Hi lovelies, yesterday's wedding shower/21st birthday party went incredibly well and I'm absolutely exhausted! I'll be sharing the details with you all tomorrow but first I want to share this incredible book and tell you about someone incredible. You know you've read a good book when you turn the last page and find yourself wanting more. When I turned the last page of Tell My Sons, I found myself searching for more as I read through Lt. Col. Mark Weber's CaringBridge page (as referenced in the book). Mark had hooked me in from the first sentence and I wanted to know every little thing I could. Mark was diagnosed with Stage IV Intestinal Cancer at just 38 and given four months to live. When faced with impending death, what do you do? and what do you do when you're faced with pain and challenges? The easy option is to give up or feel sorry for ourselves. As father of three sons and a highly decorated soldier with a zest for life, Mark decided to soldier on and fight the cancer and his predicted fate. Not one to live in dreamland, Mark realised that there was no winning this battle and he could only go down with dignity - but he never gave up his fighting spirit. Faced with his diagnosis, Mark decided to write a letter to his sons which would allow him to guide his sons through life and give them advice long after he was gone. These letters cover the conversations they would have had if he were still here. Tell My Sons is as gutsy and real as a book can get and will see you cry, laugh, cringe and think about your own life as you turn each page - and you will find yourself engrossed with every word. 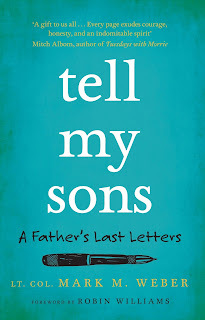 Mark wrote these letters for his sons - but what he created was a book that will inspire every reader to live life to the fullest and embrace it despite all of its challenges. Mark is a born storyteller who, through recounting his stories, shows us that we do not need to be perfect - or even pretend to be. This is a book that isn't read, but felt - and it will stick with you long after you finish. Mark uses inspiration from a military speech given by General Douglas MacArthur to tell his story through deeply personal and touching letters to his sons Matthew, Joshua and Noah. Each chapter shares stories from Weber's life, - from the early days to his military career - his ongoing battle with cancer, the treatments he endured and the way his illness affected both himself and his family. Tell My Sons details his life, his cancer, his ambitions and his philosophies in life. It is a story which showcases Weber's bravery and reslience in the face of difficulties as he tackles each one with dignity, courage and, where possible, humour. It's a story which is simultaneously heart warming and heart wrenching and will leave you with a great sense of respect for the man who cared so deeply for his family that he wanted to do everything he could to leave them words of comfort and advice for the path that lay ahead. This is a book which will be passed around from friend to friend - and one you will recommend time and time again. Generally a book can only be recommended to a certain type of person - or to someone who likes a certain type of book - but Tell My Sons is a book that each and every one of us should read. Whilst Lt. Col. Mark Weber's Story doesn't have your typical happy ending - it's a story we can all learn from. Live life to the fullest, love with all of your heart and never give up the fight. Whilst I was given an online copy of this book by the publisher, the review and opinions are entirely my own. It's a story which captured my heart, which made me cry and made me laugh. Sadly Mark passed away just days after I finished the last pages of his book - but his legacy will live on with this incredibly book. But tell me, what was the last book you couldn't put down? I'm going to look out for this one. One of my favourites is along a similar theme, Randy Pausch's The Last Lecture. Well worth reading if you haven't had the pleasure. The Last Lecture is one of my top 5 favourite books! If you liked that, be sure to read Mitch Albom's books (if you haven't already) my favourites are Tuesdays with Morrie, The Five People You Meet in Heaven and Have a Little Faith! I'll have to check out Never Tell Me Never!